You may have seen our famous "cat hammocks" at our adoption events. 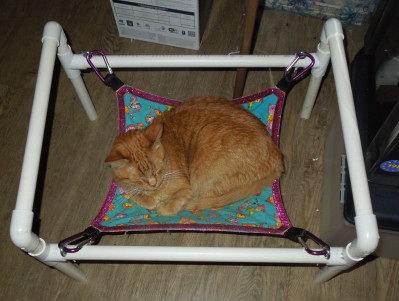 It's true, our cats love them, and we do too - they're comfy, secure and easy to set up. You can see our selection and order a cat hammock for your best friend here. They can be used in crates, for when your cat needs a little private time, for example, when he or she is sick or just wants to rest with the crate door open. Or she can hang out in a hammock stand. It's easy to make a hammock stand using a simple plan from PVC — or you can click here to purchase one from us.